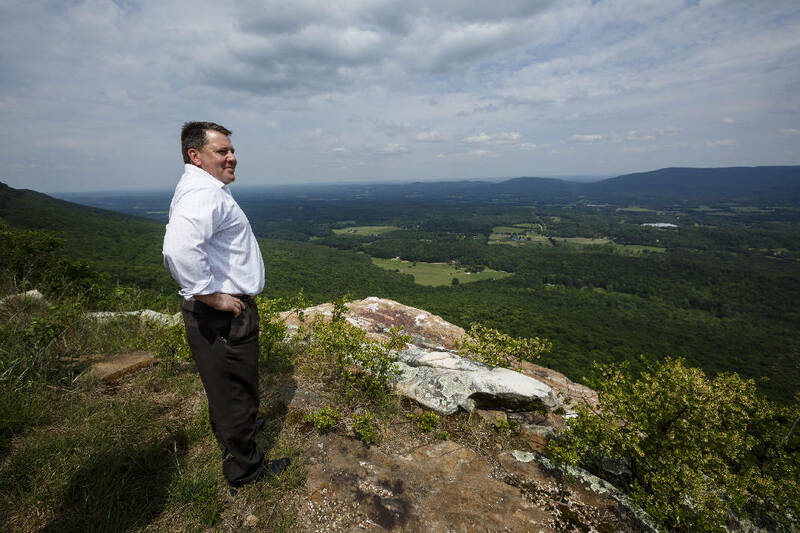 Scenic Land Company president Duane Horton looks out from an overlook near the site of the planned Canyon Ridge Resort on Thursday, May 11, 2017, in Rising Fawn, Ga. Correction: A previous version of this story said Canyon Ridge homeowners approved a 419 percent property tax hike to build the resort next door. In fact, they approved a hike of 324 percent on their local government taxes — and 103 percent when you factor in local public school taxes. RISING FAWN, Ga. — Duane Horton hooked both hands around the edges of a book, squeezing four years of his life into a 5-inch-thick document, bound in leather, sprawled across 1,200 pages. On one of the first pages, in front of copies of exhibits and the transcript of a 24-day trial, Horton read a note from a Dallas attorney. When the two started working together in 2011, the lawyer explained, they didn't exactly know what they would go through. Which brought up a good point: What exactly did they go through? "A journey!" he wrote in blue Sharpie, with the enthusiasm only an attorney can muster for a four-year legal fight. In 2015, a Hamilton County jury and judge awarded Horton $32 million after he accused a former business partner and a financial consultant of undermining his plan to build a luxury hotel on Lookout Mountain. There's not an official record to confirm it, but veteran attorneys in Chattanooga called his trial the longest in Hamilton County history — with one of the biggest awards. Horton later settled for an undisclosed amount. And he signed an agreement not to talk about the details of the case. But on Thursday, lugging his book of memories on the east brow of the mountain, Horton made an announcement: He's back and ready to build. Horton, president of Scenic Land Co., said he is pulling together $106 million to build Canyon Ridge Resort, a 178-room luxury hotel and conference center. There will be restaurants, he said. An infinity pool and a spa. A reworked golf course and a clubhouse. "I was never going to give up," he said. "But I didn't think it was ever going to happen." He hopes to raise the money this year and break ground in March. He is eyeing an opening in the fall of 2019. Owners of the 80 to 100 homes in the Canyon Ridge community next to the hotel site have agreed to a property tax increase of up to 103 percent so the county can build roads and a fire department to support the overall project. Horton and other investors will receive a property tax abatement, paying nothing for the hotel's first five years and only 10 percent of the tax rate for 25 years after that. Horton also is applying for special sales tax rebates from the Georgia Department of Community Affairs, offered through the Tourism Development Act, and hopes for approval by September. Walker County Commissioner Shannon Whitfield plans to implement a hotel tax in the county, pending approval from the Georgia Legislature next year. "This," he said, "will be the catalyst to grow the area." Builders have been announcing plans for a resort atop Lookout since at least 1995. There were some leadership struggles, investors buying each other out. In 2003, with developer Randy Baker in charge, construction began on a golf course and a community of homes. Baker, who first made his money in the NASCAR souvenir business, finished that part of the project in 2005. Soon after, Horton started looking to build in the area. He said Baker reached out to him in 2008, asking him to join forces on a resort and convention center. Horton toured the community and walked to the edge, to a shelf on Lookout Mountain overlooking McLemore Cove. This was the spot for the hotel. With a golf course already in place, he saw potential. "It was a natural fit," he said. "It made complete sense that this should be the location of a project." Then the housing bubble burst and the recession began. Financing became elusive. But by 2010, Horton said, the group started raking in some investments. The DCA gave Walker County about $21 million worth of federal recovery zone bonds to use for the project. In an effort to boost the economy during the downturn, the federal government offered tax incentives on loans for certain business developments. The program was administered through the states, to local projects. When a company issues bonds to finance projects, the buyers normally have to pay tax on the interest earned. But under this program, the government would give that money back to the company, which would, in turn, give it back to the bond buyer. It was a complicated loop, but the end result was to dangle more carrots in front of investors. In some parts of the country, it worked. In Walker County, not so much. But maybe that's because the company never got to the point of issuing the bonds. Horton and Baker have offered different accounts for why the deal didn't work. In a 2011 article, Baker told the Times Free Press the hotel project failed under Horton's leadership. And as a result, he said, he and Edmund Wall, a financial adviser with Sterne Agee & Leach, pitched another idea for a resort. Wall also happened to be Walker County's financial adviser. Then-Commissioner Bebe Heiskell was on board with the concept, going so far as to guarantee a $35 million loan for the resort. If the project had gone belly-up, taxpayers could have been on the hook. "It will surely happen at some time," Heiskell said of the resort concept in 2011. "I think it would have turned out very, very well." But that plan never materialized either. Horton sued Wall and Sterne Agee in 2011, claiming they undermined his project while supposedly working with him. Baker, who filed for bankruptcy, denied this account. In May 2015 a Hamilton County jury sided with Horton, who was on the stand for 10 days. A judge later tacked on about $11 million in punitive damages. Horton took a break from Canyon Ridge after the victory and focused on other projects. He also wanted to see whether Heiskell would remain Walker County's commissioner. In a video deposition played during the trial, Heiskell said she would support a project by Horton, but she preferred the competing concept. "There was so much political damage done at the time," Horton said. "We just wouldn't move forward (with Heiskell as commissioner)." Horton called Whitfield in December 2015, a month after the Chickamauga city councilman announced he was running against Heiskell. Whitfield said the two talked about the original project, and Horton told him he still wanted to build Canyon Ridge Resort. Horton donated $1,400 to Whitfield's campaign, and Whitfield won 73 percent of the vote in the November race against Heiskell. "They were very interested in the election," Whitfield said of Horton and his team. "And they were very interested in seeing me successful and winning. They knew I was very excited about the potential of this project." In January and March, Horton met with Canyon Ridge homeowners, asking whether they would support the project and take a tax hit to help build the resort. He said they signed a petition, agreeing to the deal. Horton will not receive any financial backing from the county other than tax incentives. On April 20, he also finished the first part of an application for sales tax credits from the state. His company has put $10 million into the $106 million project so far, Horton said. He expects to drop in another $5 million to $10 million soon. He also said the group is in talks with "a number of financial institutions" about a key loan to make the project work. "Our numbers work well for all their metrics," he said. " We believe we have a structure where we're confident about the whole thing." Horton already has partnerships with an architect and a hotel management firm. He said he is sifting through offers for a sponsor. Horton believes the project could attract 35,000-50,000 visitors per year, about 70 percent of them from out of state. The resort would be close to the Atlanta, Birmingham, Chattanooga, Huntsville, Knoxville and Nashville markets. He thinks he can attract businesses to the conference center during the week, and families on the weekends. The hotel could turn out $22 million in revenue every year and, at the beginning, employ 190 people. "We've already overcome many challenges," he said. "We're in this for the long term."